Latitude 43.097606. Longitude 0.058322. 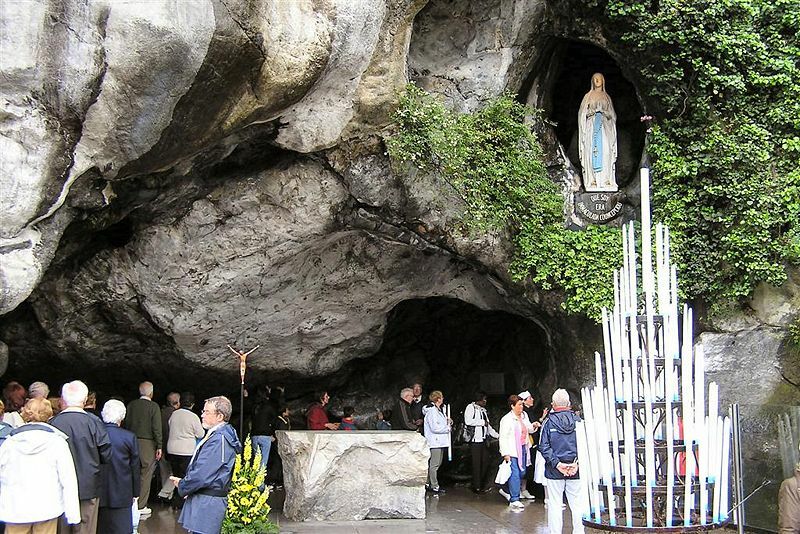 The famous 19th century healing shrine of the Grotto de Massabielle at Lourdes, in the Hautes-Pyrenees region, of south-western France is a cave and grotto located on the bank of the river Gave just beneath the Basilica of The Immaculate Conception (The Upper Basilica). Lourdes is a town in the foothills of the Pyrenees that became famous the world-over when on 18th February 1858 a young French peasant girl called Bernadette Soubirous experienced 18 apparitions or visions of the Blessed Virgin Mary, which continued until 16th July that year. The town of Tarbes is 5 miles to the north-east on the N21 highway. The name Massabiele means ‘the old rock’ or ‘the ancient mass’. In the grotto is the famous miraculous healing spring that has cured many, many people of illnesses since the very day when it started to flow again after being dry for some considerable time. A simple altar stands in the middle of the grotto and in a niche upon a rocky ledge a very beautiful statue of Our Lady of Lourdes. Bernadette became a nun in 1866 at the convent of St Gildard in Nevers, France, where she died of ill health in 1879 aged 35. She was canonised as a saint in 1933 and her body lies preserved (incorrupt) in a crystal-glass reliquary in St Gildard convent church. Today the shrine at Lourdes is the most famous Roman Catholic pilgrimage centre in the world. The small cave entrance forms the grotto of Massabielle close to the bank of the Gave de Pau river where Bernadette, her sister and a friend, came to collect wood for her families’ fire in 1858 – the site was at that time surrounded by a pig-sty and festering rubbish dump. It measures 27 metres (88 feet) in height, nearly 10 metres wide and 9.5 metres deep – the niche or crevice to the right-hand side where the statue of Our Lady of Lourdes stands is just under 4 metres high. Our Lady’s statue carved out of marble is 1.88 metres (6ft 2 inches) high and was sculptured by Joseph Fabisch of Lyons. The statue was placed in the grotto in 1864. She wears white with a blue girdle and rosary beads hang from her left arm, while yellow roses adorn her feet. Our lady looks serene with her hands raised together in prayer. Beneath the statue are the Latins words:- Que Soy Era Immaculada Concepciou – ‘I am the Immaculate Conception’. From what is known with regard to the miraculous healing spring which now flows into a large pool in the grotto it appears it had dried-up long before Bernadette came on to the scene, but during one of the visions (on 25th February 1858) Our Lady told the young peasant girl to scratch at the soil where water would then flow, and on the following day the spring was flowing very strongly forming a pool. From that day on miracles of healing began to occur and, indeed, have continued to occur with many sick and disabled people being miraculously cured after partaking of or, bathing in the holy water – something that many doctors have been unable to give any medical or scientific reasons for the many astounding cures. There are taps provided for pilgrims to collect the water in bottles, or simply to have a drink and, bathing facilities are provided for sick and disabled pilgrims. Today Lourdes is visited by thousands if not millions of pilgrims coming from all corners of the world, not just looking for a miraculous cure, but to join in with the many religious services (there is the Underground Basilica of St Pius X) and processions that take place along The Esplanade. All go away feeling greatly uplifted and spiritually renewed, and some realise that they have received a miraculous cure. The water in the grotto has a very high mineral content and has frequently been examined by scientists – indeed carbonate of magnesia, carbonate of iron, chloride of sodium, chloride of potash, silicate of soda, iodine and ammonia have all been found in the water of the holy spring, along with other minerals too; the surrounding soil being rich in limestone. It can be drunk without any danger. 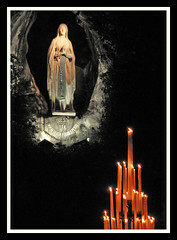 But at the end of the day it is “perhaps” faith that is the true miracle here at the grotto in Lourdes. Shields, J.A Rev., The Spirit of Lourdes, M.H.Gill and Son Ltd, Dublin, 1958. Bordes, Joseph Father, Lourdes In Bernadette’s footsteps, MSM, Vic-en-Bigorre Cedex, France, 2005. Ravier, Andre, Bernadette, Collins, London and Glasgo, 1979. Categories: Grotto De Massabielle At Lourdes In Southern France, Healing Well At Lourdes In Southern France, Holy Wells | Tags: Grotto De Massabielle At Lourdes In Southern France | Permalink.